A vegetarian friend at work recently introduced me to a vegan restaurant in El Segundo which is aptly named "Veggie Grill." They specialize in dishes featuring their "veggie proteins" including Chillin' Chicken, Too Good Tempeh, Veggie-Steak, and Veggie-Steak Burger. These proteins can be served in some super-fresh and vibrant salads or as sandwiches on their whole grain rolls. They also have some fabulous sweet potato fries. I just love both the dishes I've tried here: first it was the Carne Asada sandwich with marinated Veggie-Steak on a delicious roll with a side of slaw. 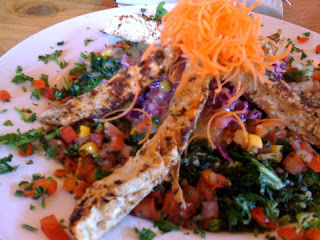 Next I tried the kale salad with blackened Chillin' Chicken.. delicious! I felt like I was getting my week's worth of nutrition in this light but satisfying dish. Fake meats have seriously come a long way. I also want to post about a vegan cafe in San Jose next.. but it seems these places have in common a way of making delicious marinades, sauces, and cooking styles to really make these proteins pop. A blog about food written by this girl from Boston named Alexis. She's currently taking culinary classes and keepin' it real on the West Side of L.A. She writes about restaurants she's tried, recipes she's made, and sometimes focuses on healthy and light food, cupcakes, vegan, Asian food, and budget conscious eating. Click on this pink button to view blog postings via RSS. Recent reviews by Alexis I. Never Fear! Cupcake Locator is Here!